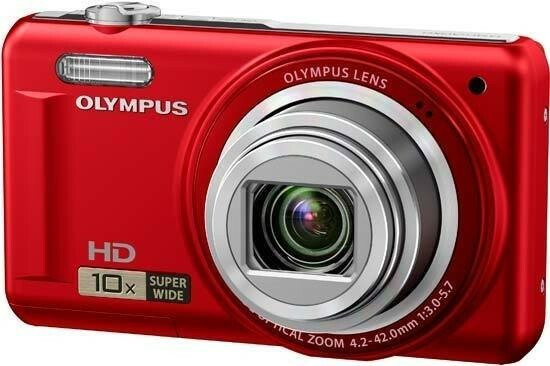 The Olympus VR-310 is a pocketable 14 megapixel travel-zoom camera that won't break the bank. Featuring a 10x optical zoom with a versatile focal range of 24-240mm, the VR-310 also offers dual image stabilisation, 720p HD movie capture, 3-inch LCD screen, a 1cm super macro mode, range of Magic Filters, auto-focus tracking and Intelligent Auto Mode. The Olympus VR-310 is available now in silver, black, red and purple, priced at around £129.99 / $179.99 in the UK and the US, respectively. To further distance themselves from the smartphone incorporating built-in cameras of increasing megapixel resolution, you'd nowadays be hard pressed to find a digital compact camera over £100 with just a 3x or even 5x zoom. In trying times we all want more for less, and that means a 7x, 8x or even 10x zoom is now within the grasp of even camera buyers on a tight budget. Sporting the same physical dimensions and appearance as its VR-320 bigger brother which means it too can claim to be just 19.3mm at its slimmest point and finished in metal rather than the expected plastic, its looks belie the fact that the VR-310 is, as the model number suggests, a pared down alternative. Suggested pricing for the 14-megapixel snapshot at the time of writing was the 'magic' £99, as opposed to a penny less than £120 for the VR-320. For this cheap-as-chips outlay can it really be a star performer? Outwardly identical, so that one would only be able to tell them apart by the small print model number etched on the top plate and the base, price aside the two cameras chiefly differ in that while the VR-320 sports a 12.5x optical zoom, the likewise 14 megapixel VR-310 makes do with a modest but still useful 10x optical reach. This is the equivalent of a wide angle 24-240mm in 35mm terms, just about stretching into 'travel zoom' or 'compact superzoom' territory. And again this is supported by dual image stabilization, with light sensitivity settings between ISO80 and ISO1600. Though it sports a Program shooting mode, the default setting on this camera is the scene and subject recognizing iAuto which also incorporates AF tracking and Olympus' Shadow Adjustment technology; this and other modes selected and pulled from the top of a toolbar running down the right hand side of the screen. There's no physical mode dial provided here for instant access with a twist of the wrist, which would make selection easier still. With the camera available in silver, black, red or purple, photos and 720p HD video are here composed with the aid of a 3-inch, 230,400-dot resolution, 4:3 aspect ratio LCD screen. And once again there are seven digital filters - or as Olympus calls them 'Magic Filters' - acting as a unique selling point. As found on the VR-320, users can choose from Punk, Pop Art, Pin Hole, Drawing, Fish Eye, Soft Focus and new addition Sparkle, adding twinkling reflections to shiny objects. 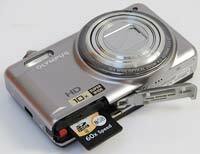 Images are saved to either SD or SDHC card, a lost for which is provided alongside the battery at the base. There's no mains charger supplied with the VR-310, but rather a mains adapter with plug and USB cable which means that the battery is charged within the camera at all times. Like with the VR-320, it also means that the camera can be charged with the aid of a USB port, not just via the mains. We also get a standard AV lead, but unsurprisingly there's no HDMI port on offer here. More disappointingly, the optical zoom cannot be used and audio recorded at the same time when recording video. You have to drill into the video options within the camera's menu folders to turn the sound off first. This is a little mystifying as the mechanics of the VR-310 doing its zooming 'stuff' are not particularly loud. That said, Olympus has decided to locate the built-in microphone at the front so close to the actual lens that it's almost a part of it. Apart from an inscription detailing the 10x zoom on offer here, as noted the front of the camera is a dead ringer for the VR-320. In fact, although said inscription looks like the usual manufacturer's sticker at first glance, this cannot be removed. The VR-310's lens takes up about half of the faceplate, in either its retracted or extended state - standing proud by a couple of inches in the case of the latter. We had the silver version of the camera in for review that looks less drab than the black, but still a little plastic-y despite Olympus insisting it's a mainly metal build. Even when the lens is retracted the front of the camera is not completely flat and level as a series of rings surround and accentuate the lens' prominence. It's into the outer chrome ring on our VR-310 that the microphone has been set. And, as this camera is so similar to the VR-320, zoom and pricing apart, you'll forgive us if some of our observations are shared. Top right of the lens, if viewing the VR-310's faceplate, we find a small indicator lamp for the AF assist/self timer, and, to the left of the lens, a lozenge shaped window for the built-in flash. The same practical issue here blights the VR-310 as it does the VR-320: we found the flaah was not located sufficiently far enough away from the slender concession to a handgrip at the front for fingertips to avoid inadvertently straying in front of the flash. At least if you realise this early on you can take measures to avoid it, but the problem is exacerbated if you hand the camera to someone else to take your portrait, and so on occasion we ended up with flash portraits where one half of the frame was well exposed, the other half in shadow. If Olympus extended the raised 'grip' so that it ran from top to bottom and shifted the flash in slightly, as we noted with the VR-320 this might prove to be less of an issue. The top of the VR-310 presents the same straightforward control layout as its big brother. Featured here are a small on/off button, raised shutter release button plus encircling zoom lever set into a chrome strip that runs the length of the top plate. As this strip is mirrored it inevitably attracts fingerprints, so you'll be constantly tempted to rub it clean. Provided the photographer has first set time and date and selected their region, this Olympus snapshot can be lined up ready for the first shot from cold in all of a couple of seconds. Alternatively a half press of the shutter release button automatically clears this preliminary set up screen. As a default the VR-310 remembers the previous setting selected if powering down and up again. This saves time, say, if you want to pre-select any of the Magic Filters or scene modes for a shot you've got in mind that's coming up, and you want to ensure the camera's prepped and ready. The other shooting modes here are Program, Scene, Panorama, and iAuto, with the modest available settings in each mode shown on a toolbar that just out below and runs down the right hand edge of the screen; how long this list of options runs depends on the shooting mode selected. The fact that the shutter release button is here raised ensures that it falls neatly under the photographer's forefinger as the camera is gripped in the right hand, with the ability to slide the self same finger over to the zoom lever and 'feel your way' to make framing adjustments without taking an eye off the screen or your subject - thanks to the zoom lever's raised front lip. Press said shutter release button halfway and focus and exposure is determined in a second or so, the screen very briefly visibly adjusting before the familiar green AF square appears on screen. Go on to take the shot and with minimal shutter delay a full 14 megapixel JPEG is committed to memory in the standard 2-3 seconds, the screen briefly blanking out before freezing with an image of the captured shot. These timings are pretty average for a camera in the Olympus' point and shoot class. Moving around to the back of this compact, and once again the LCD screen dominates the available space, with buttons located to its right and running from top to bottom where they fall under the thumb. The layout here is more spare and simplistic, with the now expected camcorder-like red video record button located near the top right hand edge. Press this whatever stills shooting mode might be in use at the time, and the regular screen display narrows, black bands cropping it top and bottom to provide a widescreen ratio image. It takes a couple of seconds' wait for recording to actually commence however. And, as explained earlier, the user can only access the optical zoom if disabling the audio, which is a shame. Video in the case of the VR-310 is then probably best viewed as an add-on for occasional use rather than a motive for purchase. Video nevertheless gets its own folder among the six offered when the backplate 'menu' button is pressed. This controls image size, frame rate, and allows image stabilization to be turned off or on during recording, and ditto sound, as discussed. The choice of video resolution is either the top quality 720p, VGA (640x480) or QVGA (320x240). The frame rate can be left at the top setting of 30fps or swiched to 15fps as desired: all very straightforward. The button below the backplate video record button is identically sized and obviously for playback. Press the menu button in this setting and the menu folders are not altered from capture mode. Tabbing down to the triangular 'play' icon provides the options of kick starting a slide show, editing images in-camera (downsizing, cropping, adding audio or carrying out an automatic lighting or red eye correction), plus erasing, setting a print order, locking against accidental deletion or rotating shots. Below the playback button is the largest control on the VR-310's back, which is the familiar four-way control pad. At 12 o'clock here we have a setting marked 'info'. Give this a press in capture mode and the display is altered however, losing the on-screen icons with the exception of an indication of whichever shooting mode has been selected, or calling up a nine zone compositional grid for anyone wishing to practice the photographic Rule of Thirds. Again this is all identical to the VR-320. In playback however a press of 'info' naturally brings up an image's capture data, including shutter speed, aperture, exposure and the like. At the centre of the dial are a self explanatory 'OK' button for implementing any setting changes required during function or menu selections, while at the bottom of the dial at six o'clock is a handy delete icon, to save having to wade into playback menus to dispatch obviously abominable images. Of course you might need to read the manual to discover how to use the '?' button, or why it's there, but once discovered, use of it goes some way to avoiding the need to pick it up again. As usual we get the cursory Quick Start manual in the box, with the full text on CD only. While the right hand flank of the camera - if continuing to view the VR-310 from the back - features an eyelet for attaching a wrist strap, the left hand side is devoid of any features except the customary pair of fixing screws.